This engaging and easily managed set promotes creativity and the imaginative telling and retelling of stories. Themed around the Billy Goat Scruff fairytale, it uses 3 base plates that can be used with 5 double sided, story-starter backdrops. These elements can be used to tell a story from start to finish, to pick out key scenes or even for exciting free play in which children can invent and act out their own stories. 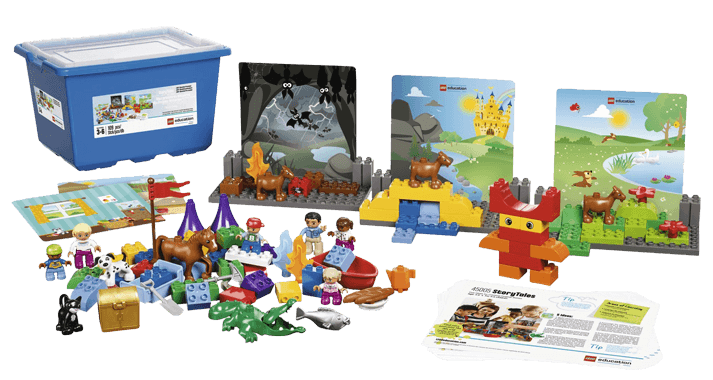 This set has been designed to teach the principles of storytelling and to help with language development. It can be used on many areas of the curriculum. The product is designed for a minimum of 4 children and comes with a range of inspirational activity ideas. Set is designed for groups of children. Includes 3 base plates and 5 double-sided backdrops, plus bricks. Features a sturdy storage box. Encourages language development through storytelling. Promotes socio-emotional development as children cooperate on telling and retelling each story. Children must use role play to explore the different characters. Set furthers creative development as children invent stories or find imaginative ways of telling new ones. Has a range of cross-curricular applications. Set caters for directed and free play.